Cincom Synchrony is a customer experience management solution that enables companies to approach interaction with their customers from a holistic standpoint and not as an individual application designed to address a particular problem within the contact center. With Synchrony, you are able to provide your customers with personalized, positive experiences in every customer interaction. Built with small and medium businesses in mind, Synchrony provides users with a plethora of capabilities and tools, including multi-channel interaction management, automated dialer, unified agent desktop and performance monitoring among others. This contact center management platform is available as a cloud-hosted software or as an on-premise solution. Synchrony by Cincom enables you to deliver smarter interactions with your customers, impacting their experience on a positive note on a very consistent basis as you grow your bottom line. With a reliable system that centralizes all your contact center applications, customer history, and resources, Synchrony gives you a solution that helps create unique customer experiences that forge emotional bonds with your customers. Synchrony not only helps your agents create better experiences for their customers, but agents themselves enjoy using the system. Everything is transparent and all the information they need to deliver better customer engagement can be accessed without any hitch. This helps simplify their tasks significantly and results in greater operational outcomes as well as improved revenue generation. Synchrony helps you determine processes that hamper your interactions with your customers and automate tasks that contribute to your operations. This ensures that your agents spend their time delivering better experiences for your customers while optimizing your profits and bringing down costs. Customers who enjoy their experiences with your business are more likely to become loyal ambassadors of your brand as well as your advocacy. And since each experience is can lead to greatly improved customer loyalty, it impacts profitability while improving efficiency. Better efficiency means reduced operational costs and more revenue for your business. If you are considering Cincom Synchrony it may also be sensible to examine other subcategories of Best Customer Experience Management Software listed in our base of B2B software reviews. Each business has its own characteristics, and might require a particular type of Customer Experience Management Software solution that will be adjusted to their business size, type of customers and staff and even particular niche they deal with. You should not count on getting a perfect app that will be suitable for every business regardless of their history is. It may be a good idea to read a few Cincom Synchrony reviews first and even then you should pay attention to what the solution is intended to do for your company and your employees. Do you require a simple and intuitive service with only basic features? Will you really use the complex tools required by pros and large enterprises? Are there any particular tools that are especially useful for the industry you operate in? If you ask yourself these questions it is going to be much easier to locate a solid software that will fit your budget. 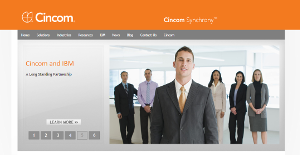 How Much Does Cincom Synchrony Cost? We realize that when you make a decision to buy Customer Experience Management Software it’s important not only to see how experts evaluate it in their reviews, but also to find out if the real people and companies that buy it are actually satisfied with the product. That’s why we’ve created our behavior-based Customer Satisfaction Algorithm™ that gathers customer reviews, comments and Cincom Synchrony reviews across a wide range of social media sites. The data is then presented in an easy to digest form showing how many people had positive and negative experience with Cincom Synchrony. With that information at hand you should be equipped to make an informed buying decision that you won’t regret. What are Cincom Synchrony pricing details? What integrations are available for Cincom Synchrony? If you need more information about Cincom Synchrony or you simply have a question let us know what you need and we’ll forward your request directly to the vendor.